I love New Year’s Eve, on condition that I don’t have to go anywhere or celebrate with anyone except my significant other, and provided we can be in bed by latest 10.30 p.m. It’s the perfect pretext for a very private feast for two. 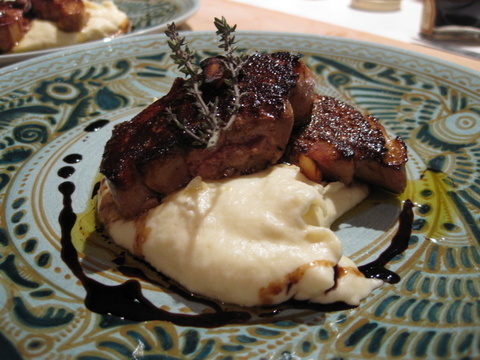 This year ours consisted of seared slices of duck foie perched on a pillow of pureed parsnips with slivers of crisp-fried parsnips and a little Balsamic vinegar drizzled round about (gotta have drizzle). A half-bottle of Mission Hill Riesling ice wine from Canada’s Okanagan Valley from grapes frozen on the vine, pressed frozen with all their concentrated essence and transmuted into a deep golden elixir, provided a serendipitous match: a brilliant backbone of acidity balanced the wine’s natural sweetness and cut across the unctuous richness of the foie and the creamy parsnips. Return them to the pan and set aside till ready to reheat. In a heavy pan (copper or non-stick) heat 1 teaspoon of oil and fry the reserved slivers of parsnip briefly till golden, flipping them over once. That sounds like the perfect new year’s eve to me!!!! Hope next year is a happy and healthy one for you Sue.